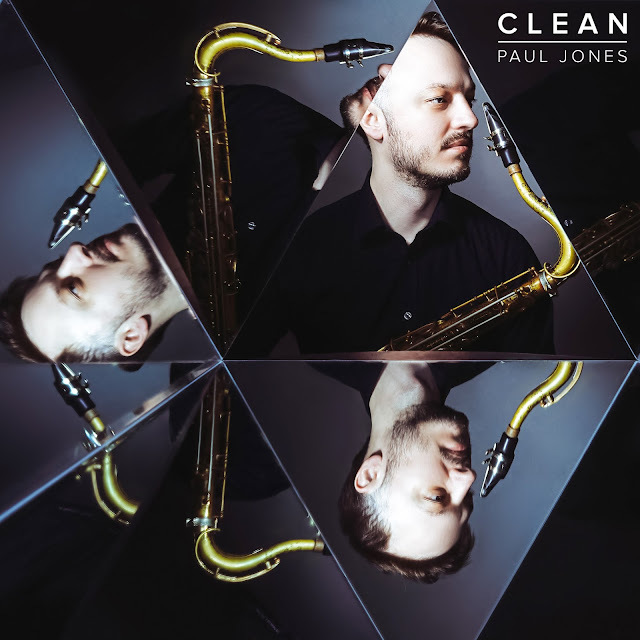 Saxophonist/composer Paul Jones draws from influences as diverse as contemporary hip hop, 20th-century minimalism and leading-edge jazz on his second album as a leader, Clean. Both heady and heartfelt, Jones' compositions may be sparked by a literary turn of phrase or the unexpected passing of a close friend, always finding unique ways to overlay the emotional onto the intellectual. Clean (due out August 4 from Outside In Music) unfolds with the evocative narrative flow of hip hop groundbreakers like Kendrick Lamar while building on the unique architecture of minimalist pioneers such as Philip Glass and Steve Reich. 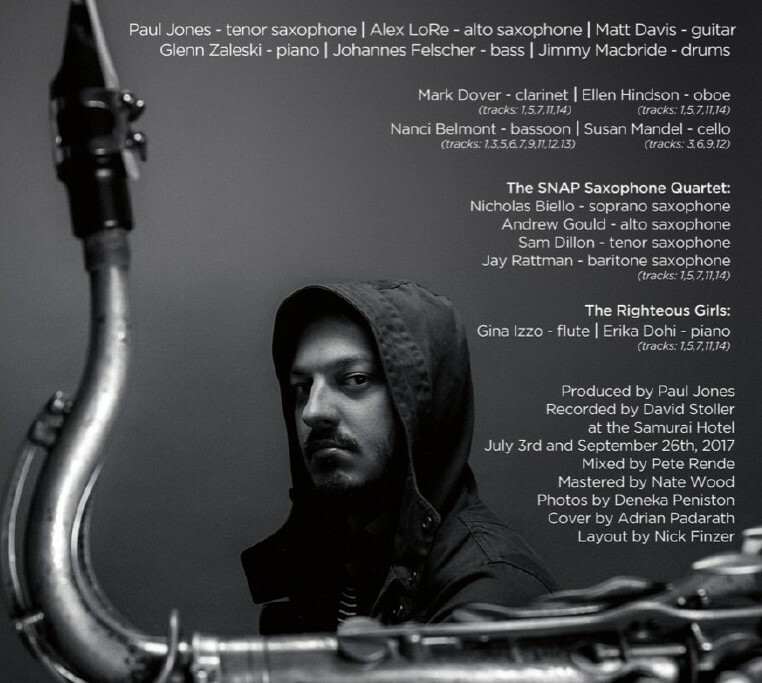 This singular music is realized with the help of Jones' core sextet, a group of distinctive artists who are all leaders and composers in their own right: alto saxophonist Alex LoRe, guitarist Matt Davis, pianist Glenn Zaleski, bassist Johannes Felscher and drummer Jimmy Macbride. They're joined at various times by a woodwind octet that brings together The SNAP Saxophone Quartet and a chamber group (clarinetist Mark Dover of the Imani Winds, oboist Ellen Hindson, bassoonist Nanci Belmont and cellist Susan Mandel) as well as genre-blurring duo The Righteous Girls (flutist Gina Izzo and pianist Erika Dohi. The music on Clean was birthed at the picturesque Banff Creative Arts Centre in Alberta, Canada, where Jones sequestered himself in January 2016 to begin devising the follow-up to his well-received 2015 debut, Short History. With the sounds of austere minimalist compositions ringing in his ears and his love of hip hop reignited by the release of Lamar's landmark To Pimp a Butterfly, Jones set to work finding ways to unite these seemingly disparate passions. "I used to listen to a lot of hip hop in high school, and Kendrick's album reminded me of my love for the music," he recalls. "One of the things that a lot of hip hop albums do that jazz albums don't do as much is try to tell a story from start to finish. 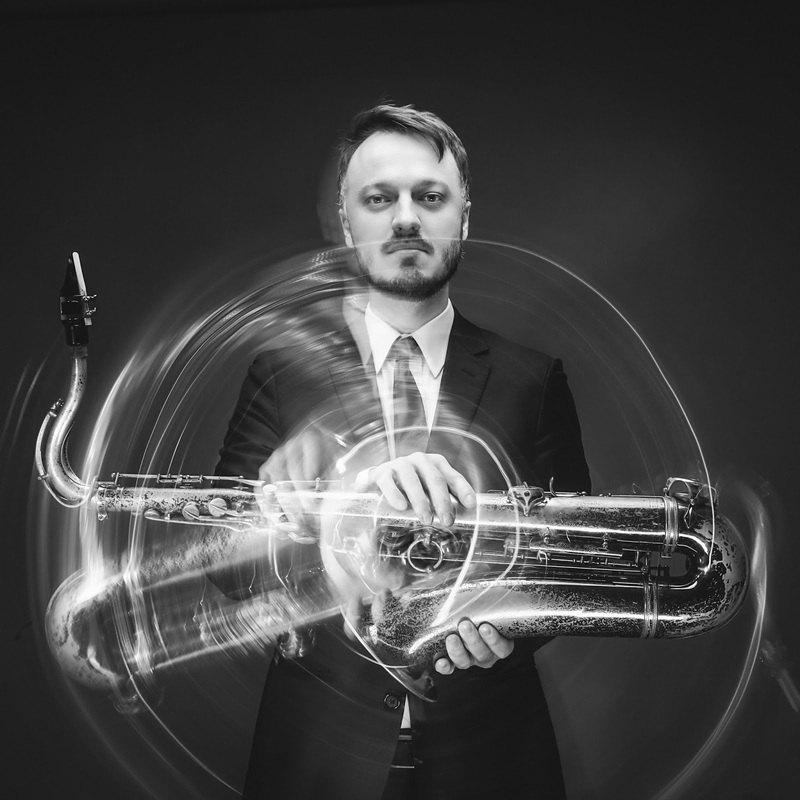 I wanted to try to do that by using different song lengths and textures, and I thought that using woodwinds in the style of Steve Reich and Philip Glass would provide interesting sonic breaks between the jazz songs." In challenging himself to find new sources of inspiration for his music for Short History, Jones invented a method of assigning different musical notes to each letter of the alphabet, then using different words or phrases to generate melodic material. On Clean he developed that technique further, adding a random number generator that gave a wider range of notes as well as intervals. As mathematical and complex as that may sound (and no doubt is), Jones never loses sight of the emotional core of his music, also dipping into the well of personal experience to deepen these uniquely-devised melodies. Nowhere is that more striking than on the brief "Romulo's Raga," a dizzying chamber interlude sparked by the murder of Romulo Herrera, the longtime chef at the well-known Cornelia Street Café, where Jones worked by day. "Hearing the news of this incident was almost incomprehensible to me," Jones writes in his liner notes. Composed in the wake of the tragic news, "Romulo's Raga" became the leaping-off point for several other chamber pieces interspersed throughout the album, including opener "Ive Sn Th Gra Md," "It Was Brgh Cold," and "Im Prety Uch Fkd." Those aren't typos - each of those titles are borrowed from the opening lines of classic novels, with each letter allowed to occur only once. The first is a slight misquote from Allen Ginsberg's era-defining poem "Howl" ("I've seen the [great] minds of my generation destroyed by madness"), the second from George Orwell's ever-timely Nineteen Eighty-Four ("It was a bright cold day in April, and the clocks were striking thirteen"), and the last from Andy Weir's The Martian (you can guess it). "I Am An American" is the first line of Saul Bellow's The Adventures of Augie March, though with all those A's intact. "The Generator," though a shimmering ballad in execution, references Jones' "nerdy compositional method" explicitly, as does, albeit in a more self-deferential fashion, "Alphabet Soup." The technique serves two purposes: it takes care of the ever-present challenge of coming up with new song titles while mandating a unique genesis for each piece. "A lot of people just sit down at the piano and expect magic to happen," he explains, "and we all end up coming up with the same ideas over and over again. I wanted to find a way to get at different harmonic and melodic ideas." The process doesn't stop there, however. Though initially generated by the letters in the two names of its title, "Buckley vs. Vidal" bristles with the adversarial tension of the infamous televised debates between the celebrity intellectuals. "Hola, Amigo" takes its title from a sign spotted in Canada - with a phrase that no native Spanish speaker would ever utter, suggesting, especially as it follows the ambiguous "I Am An American," the fraught territory of cultural difference and miscommunication - especially timely given recent political developments. 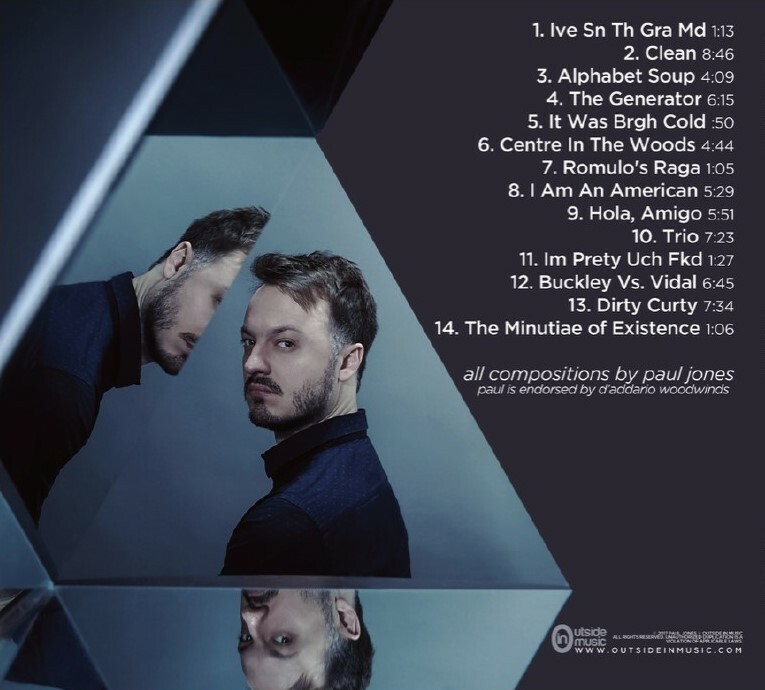 The album's title and its namesake track, while hinting at the fastidious intricacies of Jones and his stellar ensemble, simply echoes his own nickname from Maine's Camp Encore/Coda, where he is a faculty member. It's humorously bookended by the jerky rhythms of "Dirty Curty," the less appealing sobriquet of an old friend who went without showering for three months - during which time he met the love of his life. "Centre in the Woods" tips its hat to the scenery of the Banff Centre, while the frenetic "The Minutiae of Existence" tallies the banal necessities of daily life. His unique blend of jazz, classical and pop music influences unite Jones with a cohort of young innovators on the modern NYC scene. They include artists with whom Jones has worked, including Matt Davis' Aerial Photograph, Nicholas Biello's Vagabond Soul with Clarence Penn, R&B singer-songwriter Eli "Paperboy" Reed, Leon Boykins and Jonathan Parker. While a student at the Manhattan School of Music, Jones also had the opportunity to perform alongside such greats as Randy Brecker, Dave Liebman and Joe Lovano. He's also taught privately at CenterStage, Harrison School of Music, Needham Music, PS-290, and the Rye Arts Center, and given master classes at the Contemporary Music Institute in Zhuhai, China and the Gimcheon School of the Arts in Korea.